Niche cocoa Industry is committed to helping ensure that more than 60 per cent of the coutnry’s cocoa harvest is processed locally, the Chief Executive of the company, Mr Edmund Pokuase, has announced. As the number two producer of cocoa in the world, Mr Poku said Ghana needed to find innovative ways of increasing the quantities processed to earn more revenue and create jobs for the teeeming youth. “Our nation produces a world-class cocoa crop but most people rarely have a chance to taste it,” Mr Poku said, noting that such a situation needed to be reversed. 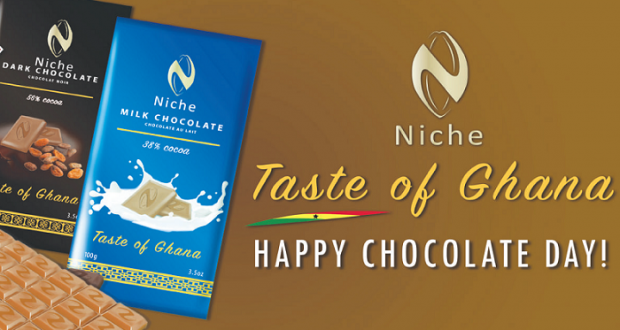 He was speaking to the Daily Graphic after the launch of Niche Chocolate, the company’s brand of chocolate processed at its factory at the Tema Free Zones Enclave. Most of Ghana’s cocoa crop is exported as beans or semi-finished products, while the majority of chocolate found on local shelves are imported from abroad. COCOBOD, over four years ago, launched a campaign to increase the consumption of locally produced cocoa products and this is what Mr Poku has pledged to help promote. “Ghana’s per capita chocolate consumption is estimated at just over 0.5kg per annum while Europe’s average is four times greater at more than 2kg. Our number is far too low, so a strategy to change this is needed,” he said. 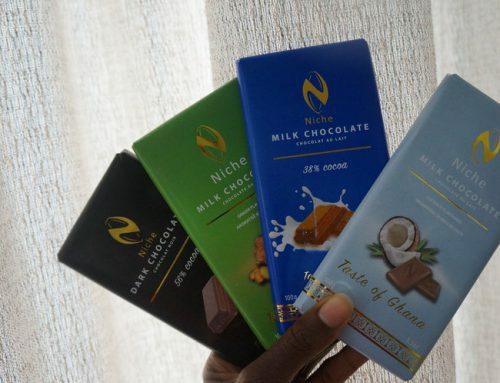 “Niche’s new chocolate line is a step in the right direction and we believe our chocolate will delight millions while being recognised for its excellence throughout the country,” he added. Until Niche Cocoa’s entry into the cocoa processing business, only CPC refined chocolate in the country under its Golden Tree brand. As a result, Niche Cocoa’s entry will be a significant addition to the country’s drive to ensure increased local consumption. Niche Cocoa’s CEO explained that the company’s overall objective was to make quality chocolate broadly available to the people of Ghana. 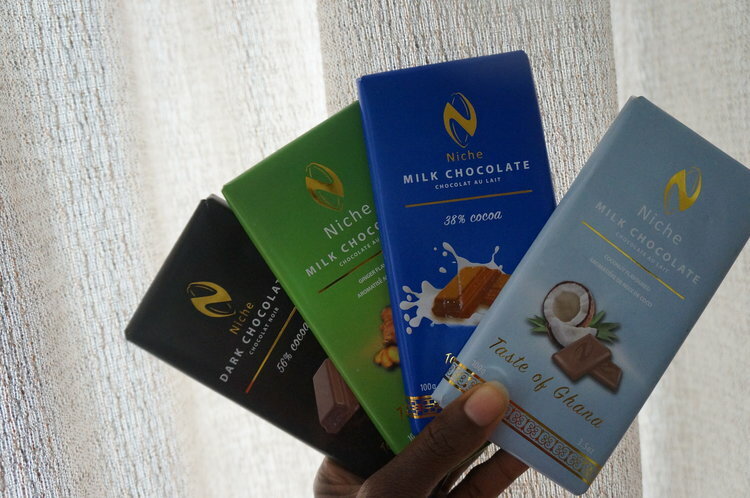 Based in Tema, Niche Cocoa has expanded its operations to include the production and retail of chocolate in the country and abroad. The company’s brand, Niche Chocolate, which includes milk and dark chocolates, will be launched today, Valentine’s Day. Mr Poku explained that the decision to enter into the chocolate manufacturing business was in line with its goal of adding value to Ghana’s cocoa, which is the country’s leading cash crop. After a factory tour, the General Manager of Niche Cocoa, Mr Lloyd Ashiley, said trial runs of the chocolate manufacturing line had been completed and the results found to be optimal. Mr Ashiley explained that Niche Chocolate bars had been specially formulated to provide high quality chocolate at an affordable price. Niche Cocoa started operations in May 2011 with 100 workers and an installed cocoa processing capacity of 30,000 metric tons (MT) per annum. Six years later the company has doubled its capacity to 60,000 MT per annum. It has also boosted its workforce to 250. Due to its success in exporting processed cocoa, Niche received the Presidential National Award for Export Achievement. It was adjudged the Exporter of the Year for 2013, 2014, and 2015. Citations that accompanied the three awards said the honour was in recognition of Niche’s contribution to Ghana’s global trade. Despite receiving significant honours during its brief existence, Niche is not content to rest on its laurels. In addition to chocolate, by year-end 2017 the company also plans to introduce chocolate spreads and instant chocolate drinks onto the domestic market. “Not only do we want to be Ghana’s premier bean-to-bar producer, we also want to be the best when it comes to bean-to-table,” the CEO explained.